Early Morning Bugling Elk facing to the left, custom carved in knotty pine door. You can almost feel the crispness in the mountain air where the elk bugle early in the morning. 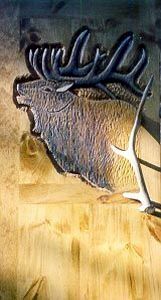 One of Dennie's most popular door carvings, the elk can be carved facing either left (as shown), right or full front face. This knotty pine door features an elk antler door handle and inlaid turquoise for the elk's eye.